Note: Each design is pictured here as a bracelet. Click here for Size Descriptions and Additional Items Available. The color blue enhances spiritual and mental health and increases inner peace. The blue and white Chinese porcelain beads and the "Yin-Yang" symbol represent balance of life. Hematite symbolizes a reduction in stress while increasing strength and energy. The pink Rhodenite; self-esteem confidence and restoration of physical energy. The rose; opening up to love and friendship. The clear, blue and gold "swirl" beads insure a good circulation of all qualities within the bracelet. All items in threes, (three porcelain beads), convey health, wealth, and happiness to the person wearing the bracelet. Austrian Crystals represent decisiveness, clarity of thought and the ability to make sound decisions. The color black symbolizes strength, protection, and inner elegance. The mother of pearl stars denote warmth, nurturing, understanding and radiant happiness. 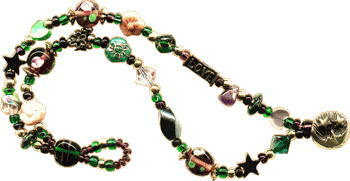 All items in threes, (three stars), convey health, wealth, and happiness to the person wearing the bracelet. Bliss is supreme happiness; a state of being in balance mentally, emotionally, physically and spiritually. The amethyst happy drop reminds us to think uplifting thoughts. The three, tri-sided beads, denote convergence of Mind, Body and Spirit. The heart stimulates unconditional love. Hematite represents healing, vitalization of spirit, and promotes optimism and personal magnetism. The five points of the star guide us to personally invest with prayer, meditation, study, service, and circulation. The combined colors of purple and green, cultivate happiness with peace of mind. All items in threes convey health, wealth, and happiness to the person wearing the bracelet. The Comfort Bracelet is about loving and nurturing our inner self. The lantern beads remind us that regardless of outer appearances, conditions or restrictions, there is always a place of greater light, security and warmth; a "go to" place within us. As a leopard naturally finds security by its ability to blend with its' environment, the leopard stones represent our ability to safely adapt. The mother of pearl happiness drops remind us to think happy thoughts with love, respect, and understanding. The hand; giving and receiving love. The flowers; opening up to love and friendship. The hematite heart; stress release, energy, and healing. The five points of the star; prayer, meditation, study, service, and circulation. Items in threes, convey health, wealth, and happiness to the person wearing the bracelet. Compassion is the art of listening with your heart, while investing in others with unconditional love. If we discipline ourselves to focus on the "We" (as in Wellness) instead of the "I" (as in Illness), we empower ourselves through compassion. The leaf is for our willingness to listen and grow. The tulip represents forgiveness. The Yin/Yang bead is for balance of emotion. Crystals; clarity of thought. Hematite; stress release, healing, and energy. The two bone faces; good relationships. The bone swirl bead (inner ear) reminds us to practice the skill of listening. The white howlite heart and chips are for new beginnings. All items in threes, (3 black & gold beads), convey health, wealth, and happiness to the person wearing the bracelet. Dreams are personal pathways to creativity, imagination, and boundless possibilities. Follow the dream in your heart, do what you love, and love what you do and you'll make your dreams come true. The hand expresses a willingness to receive your bountiful share of all that is wonderful. The blue flower reminds you to open up to love and friendship. The butterfly; the ability to rise above fear and doubt. The hematite heart is for stress release, energy and healing. is for stress release, energy and healing. The happiness drop lets every cell in your body dance with joy. The star denotes radiant happiness. The turquoise represents emotional balance, good communication, friendship and loyalty. All items in threes, (three flat, oval cloud beads) convey health, wealth, and happiness to the person wearing the bracelet.